Weston Super Mare in North Somerset. 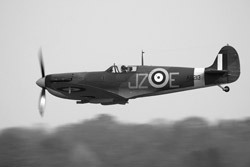 By 1941 Masters and Hurricanes were in use at night, but it was during the day that the second Luftwaffe visit was made. A bomber dived out of low cloud on March 26 and its gunners fired a short burst at aircraft on the ground. Again no damage was done. No 9 SFTS became 9(P) AFU in February 1942, transferring to Castle Combe a month later while Babdown Farm was re-developed. The airfield was brought to full RGL standard by laying two (later three) Sommerfield track runways and by June a number of Blister hangers had been erected around the perimeter. The HQ site alongside the farm buildings was also well on the way to completion, as were the instructional and communal sites dispersed to the east at Beverston Old Broke and Broad Newell Covert. On the re-opening in August 1942 two Flights of 3 Flying Instructors School moved into the accommodation. The unit's night flying was concentrated at Babdown and the circuit was soon alive with Oxfords and Masters. It was also used by Spitfires from 52 OTU during the day and on January 26th 1943 was host to three lost aircraft, an Oxford, a fully bombed-up Wellington and a Curtiss Cleveland biplane. Not many of the latter flew in this country, but one which did wore a maintenance serial issued to grounded airframes. Perhaps it was this famous (or infamous) machine. 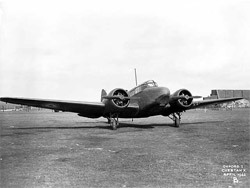 During 1943 a Standard Beam Approach was installed on the main 3,900 ft (1,189m) east/west runway and in June 1532 BAT Flight arrived to provide training on this aid using Oxfords. Other developments included the construction of a new maintenance site on the south-east side where three Teeside hangars were erected. 3 FIS left at the end of September and although the technical site was still incomplete 15 (P) AFU moved in a month later, leaving its maintenance squadron at Andover until January 1944. By March 15(P) AFU was completely settled in and it was undoubtedly the new electric lighting on the runways which attracted a single bomber during the night of May 15. It dropped two bombs but neither did any damage, indeed throughout Babdown's short history, training accidents proved much more hazardous than the attentions of the enemy. A particular nasty one occurred on August 29 1944 when the runway controller was killed by an Oxford which landed on his caravan. The wet weather during the autumn and winter of 1944/45 caused the runways to lift and for three months the airfield was only partially serviceable. The closure of Long Newnton increased the load on Babdown, but it was not for long because the unit ceased training on May 28 and the last aircraft left on June 20 1945. 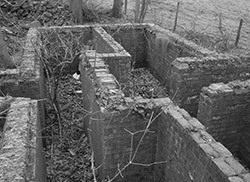 Babdown reverted to Care and Maintenance in June 1945 but the following month was taken over as a sub-site by 7 MU Quedgeley who used the hangers for storage until January 1948 when Babdown became an inactive site and was soon derequisitioned. In 1980 the three Teeside hangars were in good condition and in use. Amongst the many derelict buildings alongside the A4135 a farming contractor used some patched-up ones until recently, but the site has now been cleared.